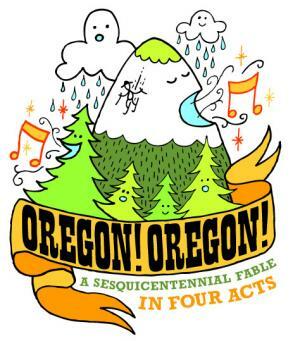 Oregon’s Willamette Week Online (WWeek.com) reports that Portland’s September 5th live performance of Stan Freberg‘s 1959 musical “Oregon! Oregon!” has sold out, as well as the Sunday, August 30th show in Jacksonville, OR. According to WWeek.com, you can tune into a broadcast of Live Wire! Radio‘s 8.22 live recording (which “previewed three numbers from the show”) today (Saturday, 8.29) at 7 PM (PST) on Oregon Public Radio… which is only useful to those living within the broadcast area, unfortunately. OPB.org does appear to offer a streaming live broadcast, but (and this is very frustrating to this Freberg fan) clicking the “on demand” link on the site to listen live yields a “502 Bad Gateway” page (whatever that is). I am contacting Live Wire Radio to see if perhaps they might be offering this same broadcast in the future by way of their podcast. In 1958 – to celebrate the Oregon’s centennial (100th birthday) – the Blitz-Weinhard Brewing Company commissioned the Grammy Award-winning radio personality Stan Freberg to write a 21-minute-long musical comedy about the beaver state. What resulted was a hilarious tale of two explorers in 1859 named Harry and David, their encounter with a witch, and the subsequent birth of a state which must go back into the bottle after 100 years … that is, if the citizens of 1959 can’t break the spell. The plot, (attributed to “M. Goose”) loosely follows the tale of Rumplstitskin, who is personified in this tale as a Witch, who “bottles” states. When the state of Oregon is un-corked, the Witch tells the two explorers, (named “Harry & David” in an obvious commercial nod to the Medford, Oregon mail order gift fruit outfit), that it must go back in the bottle after a hundred years. When the Centennial rolls around, the witch offers a reprieve if someone can come up with her real name. A California Fruit Inspector happens to over hear her, and saves the day. The Witch, (aka “Miss Columbia River Salmon 1822”), stomps her feet so hard, she falls through the dock at the Centennial party and plunges into Coos Bay. Click here to listen to the original 1959 recording of the “Oregon! Oregon!” theme, courtesy of Oregon150.org. For complete details on the original musical recording and to listen to the album in its entirety, please visit Shellac Radio — shellac.org. We had a fine cast today. We have our regulars — Frank Welker (as the cat), Gregg Berger, Wally Wingert and Jason Marsden. We have our semi-regulars — Audrey Wasilewski, Julie Payne, Laura Summer and David L. Lander. And today, we had as guest stars, Stan Freberg, Laraine Newman and Jack Riley. 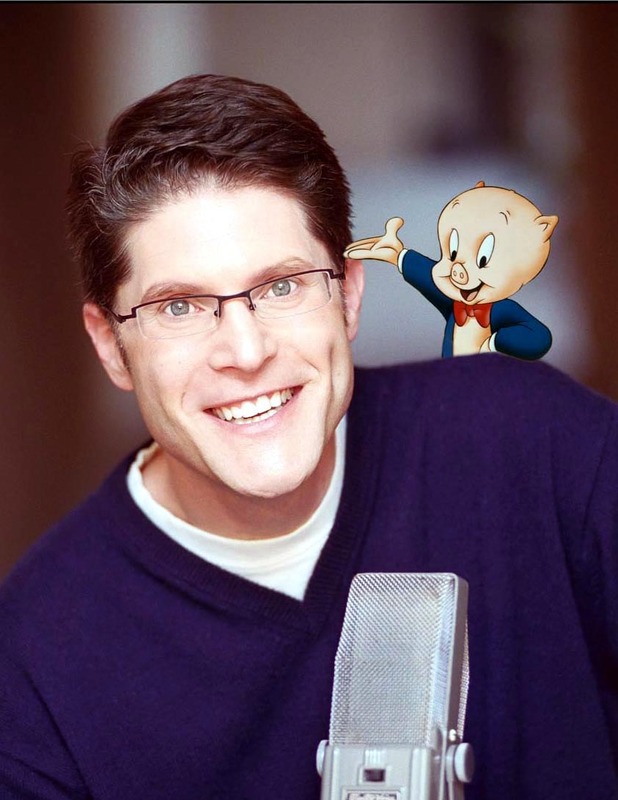 Whenever anyone asks me the secret of directing cartoon voices, I tell ’em it’s easy. Hire a cast like that, tell ’em which microphones to use and get out of their way. It’s hard work but enormous fun. Having grown up listening to Stan Freberg records (and having purloined much of my sense of humor from the man), I still find it a little unbelievable to be working with him. – Beany and Cecil (Matty’s Sunday Funnies): The Special Edition Volume 2 releases September 8th and includes 11 cartoons and bonus content, including “Time for Beany” (which features Stan Freberg and Daws Butler) and a feature entitled “Bob Clampett and Friends.” It features the voices of Jim MacGeorge, Irv Shoemaker, Lord Buckley, Scatman Crothers, and Paul Frees. A few years ago, a superb DVD came out that mainly covered the animated Beany & Cecil but it was crammed full of special features about Bob’s life, including materials from his vast files. The man saved everything and his son Robert Junior, in assembling the DVD, dipped into those archives and offered up some gems. I can’t think of another animation-related DVD I’ve ever bought that gave you more for your money. Alas…maddeningly…it was not a big success. It did not spawn a whole mess of other volumes and it went out of print and became hard to find. So now we have two happy announcements. One is that Volume Two has been assembled anyway and it’ll be out next month. The other joyous news is that the Clampett Studio, run by his family, has stumbled across a few boxes of Volume One in the warehouse. So if you didn’t get one, you can get one now when you order this new collection. It has my highest recommendation and I can’t imagine that the new volume won’t, as well. Go here. Click. Enjoy. You will. It’s also worth noting that Stan celebrated his 83rd birthday on August 7th. Happy belated birthday, Stan! “I think the Shout! Factory collection will exceed all expectations,” says Berger. “They put so much care and devotion into the presentation. I’m sure the fans are aware of the main content, but they aren’t aware of all the ‘treats’ they’ve put in here. The packaging is coffee-table presentation level on its own. His particular pride and joys for both sets are the extra content where he sits down and just chews the fat with many of the surviving voice artists. Continue reading: Me Gregg Berger! Me Voice of Grimlock! I know this will be a great disappointment to those attending the con, but on the upside there will be plenty of other cartoon voice actors in attendance during this weekend at Comic-Con, and on Wednesday I plan to post a rundown of scheduled events featuring voice actors. Shout! Factory will kick-off selling two DVD compilation sets at Comic-Con, G.I. Joe: A Real American Hero—A Complete Series Collector’s Set ($155) and The Transformers: 25th Anniversary Matrix of Leadership Edition Collector’s Set ($150) [previously reported here]. Consumers who buy either title at the show will receive an exclusive lithograph signed by G.I. Joe artist Tom Feister or a lithograph signed by Transformers voice Frank Welker, respectively. Update: 7.22.2009 — TVShowsOnDVD.com has a press release with a photo of the Transformers lithograph featuring Megatron, along with news that Gregg Berger (voice of Grimlock) will be signing autographs at Shout! Factory’s booth (#3749 in the main hall) on Saturday and Sunday at Comic-Con. 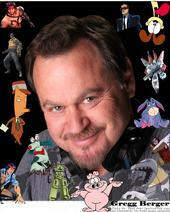 And regarding Frank’s website, Doreen has updated the “Ask Frank” page on FrankWelker.net. And I’ve covered a number of other Frank-related news items in recent months, which you can review by clicking here. TFormers.com has reviewed Shout! Factory’s “Matrix of Leadership” DVD box set containing the entire 98-episode run of the original Transformers animated series, and includes images of the artwork and product as well as a detailed list of the content and bonus materials. Hasbro provided us with the same masters Rhino used for their releases. HOWEVER… There have been changes made. I, personally, went to New York, where the original broadcast one-inch masters are housed, and found each of the problem areas, in regards to animation. The one-inch masters have not physically held up well over the years. In some cases, they’re nearly unwatchable. Therefore, instead of simply transferring and using masters of the one-inches, we found every instance of faulty animation demonstrated on a YouTube video or mentioned in a rundown we could find online (and even found some of our own) and corrected them, replacing the faulty digibeta master material with the best-quality one-inch source material. Finally, we color corrected everything to match–as best we could–the shots before and after. Surprisingly, unless you know specifically what you’re looking for, you won’t even notice many of the instances of slightly softer picture. It looks REALLY good. Hasbro never kept high-quality masters. They kept VHS screeners of their commercials, strictly for reference later. So when you say, “why couldn’t they get the original copies from Hasbro?”, we actually did. Still, there are some pretty cool commercials here and I’m looking forward to having them included. We chucked the Rhino audio. You will no longer hear additional sound effects or music, not previously heard in the broadcasts. We went back to the original source mono and created a nice stereo track to even out the audio. It sounds really nice. As much fun as it would be to listen to folks talk about the episodes, one thing I’ve learned over the years–and definitely over the last couple months–is that the voice actors know the least about the series. It’s not a slight on them. It’s simply a fact that most of these guys (and girls) were voicing multiple characters on multiple shows at the same time and were so busy that they never even really got a chance to sit down and watch the shows themselves until much later. According to Shout! Factory’s official site for the release — TransformersCollectorsSet.com, the reunion includes video of a roundtable discussion between key members of the original voice cast: Jack Angel (Ramjet), Michael Bell (Prowl), Gregg Berger (Grimlock), Aurthur Burghardt (Devastator), Corey Burton (Spike Witwicky, Shockwave), Richard Gautier (Rodimus Prime), Neil Ross (Slag), and Frank Welker (Megatron, Soundwave, and several others). And while it’s still disappointing that they couldn’t have involved other core cast members, such as Peter Cullen (Optimus Prime, Ironhide), Susan Blu (Arcee), and Dan Gilvezan (Bumbleee), or series voice director Wally Burr, Shout Factory is still worthy of props for bringing this great group of talented individuals together as a bonus feature for the fans. At a time when other studios and distributors are pushing Blu-Ray over DVD and cutting back on bonus content (or simply not bothering to produce any at all), Shout Factory’s efforts are commendable and I am appreciative of them for it. TFormers doesn’t give the exact runtime for this feature, except to say that you should “allow 20-30 minutes for each documentary or interview,” and adds that it cast reunion is their “favorite extra” on the release. The official site states that this release (which began shipping pre-orders today, July 13th) will be “sold while supplies last,” so if they happen to sell out, your alternative is to wait for the individual releases to reach stores. Season 1 released in June, but the next two releases to follow aren’t expected until September. Rhino’s original releases, for all their faults and flaws, were still in high demand and difficult to come by due to limited stock and later when they all when out of print after Rhino lost the distribution rights. So I would highly encourage my fellow Transformers fans to order this magnificent box set while it is currently available. Related post: 7.07.2009 — Optimus Prime Guests on Letterman. Just about anything Transformers-related I post here tends to get a lot of views. So it’s a bonus that I’ve been a fan for 25 years and don’t mind covering TF-related news any opportunity I get. I’ll be updating this post throughout 2009 as new guests are announced. – Neil Kaplan, voice of Optimus Prime on Robots in Disguise, will be appearing April 17-19 at Xanadu Las Vegas and May 29-30 at Adventurecon in Phoenix, AZ. Visit Neil’s “I, of The Wolf” site for future upcoming appearances. – Dan Gilvezan, who voiced Bumblebee and other supporting characters in the original “G1” Transformers animated series, will be appearing April 25-26 at the TFCon 2009 in Toronto, Canada. – Richard Epcar, voice of Armorhide on Robots in Disguise, will be appearing May 22-24 at JACON 2009 in Orlando, FL. Additionally, Gregg will be appearing August 15-16 at Auto Assembly 2009 in Birmingham, England. – David Kaye, who has now voiced Megatron in five Transformers TV series as well as the voice of Optimus Prime on Transformers Animated, will be appearing May 30th *only* Botcon 2009 in Pasedena, CA, and July 24-26 at MechaCon 2009 in Lafayette, LA. – Ian James Corlett, voice of Cheetor on Beast Wars and Beast Machines, will be appearing August 15-16 at Auto Assembly 2009 in Birmingham, England. Previous news: 3.24.2009 — Frank Welker to Voice ‘The Fallen’?.